Since launching their first proper brewery earlier on this year, Scotland’s Fierce Beer Co. has become intensely prolific. Having produced over 50,000 litres of beer within the past six months, the brewery offers a whopping core range of ten beers amongst some limited edition offerings and collaborative efforts of which are currently in the pipeline. Now operating from an industrial estate in Dyce, Aberdeen, Fierce was originally set up by joint owners Dave Grant (Managing Director) and David McHardy (Operations Director) as a home-brew hobby, initially selling kegs to Aberdeen clients from a home nano-brewery. Now, the new brewery boasts a state of the art stainless steel brewing set up with six fermenting tanks and an in-house bottling and labelling machine. As for the beers, unlike many other local breweries there is very small focus on IPA. Instead, the core range’s main focus is a selection of pale ales, fruit beers and dark porters, all intended to deliver strong, bold flavours. From the four porters on offer, Peanut Riot is a fine example of the brewery’s unique dynamic for crafting beers that are most out of the ordinary. When poured, the completely opaque black beer with its thin tan head offers potent aromas of peanut, as promised by the name. Elsewhere sweet aromas of chocolate, caramel and roasted nutty malts are joined by some subtle smokiness and dark fruit notes, yet on the palate it’s the taste of peanut that’s most prominent, accompanied by a little salt. Further notes of chocolate then arrive upon the tongue amongst some further caramel sweetness and bitter notes of burnt malts that work in harmony to bring balance. 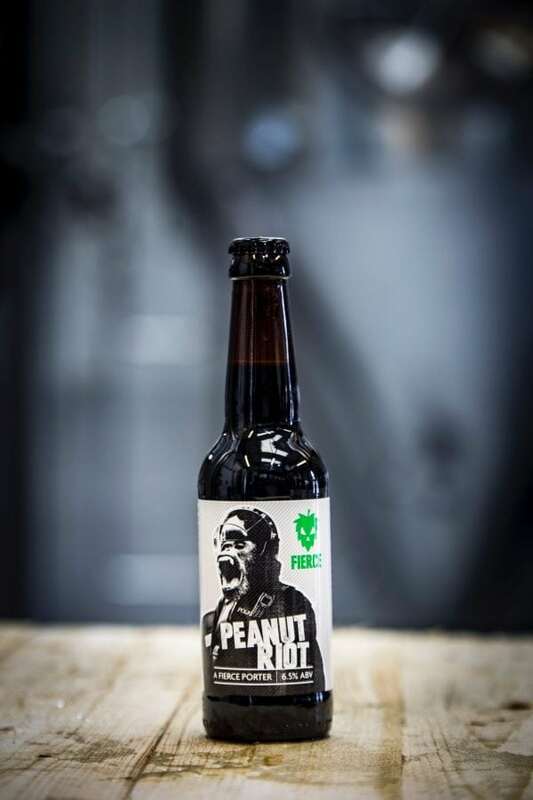 Ending with a short, oily finish – unlike many of the novelty flavoured beers on the market, Peanut Riot is a very serious brew from one of Scotland’s fastest rising craft breweries. Further information on Fierce Beer Co. can be found at fiercebeer.com. Previous PostInsta-scran: Why Are We Obsessed With Food Pics?